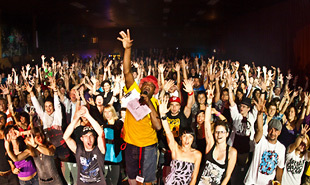 The Urban Dance Camp is the world’s leading dance intensive education. 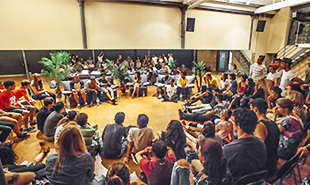 The annual international workshop event has become after 15 years the best dance intensive education with the highest standard of teaching and unique talents from around the world. Dancers, teachers and choreographers from more than 40 countries participate each year. The UDC is the perfect event to present your dance skills to a world wide choreography-oriented audience, to get new inspirations for your own choreographies and opportunities to meet new international partners. The Urban Dance Camp offers an incredible way of learning and experiencing new things that you haven’t done before. Click here to get more information how to sign in for the UDC International 2019 in Lörrach, Germany. Dance with and learn from the world’s best faculty. The Urban Dance Camp presents every year an amazing line up with dance legends, youtube stars and top international choreographers from Asia, Europe and America. All of them proved their skills in the past years and become the best and most qualified educators for choreography-oriented dancers, teachers, and choreographers. To find more details of the Urban Dance Camp faculty – click here. The best dance education of its kind. The UDC 2019 offers you more than 88 classes over a period of 26 days. The workshops are ideal for dancers, teachers & choreographers with experience. The level of the classes is for intermediate and advanced dancers. The UDC is not recommended for beginners, who never danced before. Age restriction: Participants have to be at least 15 years. If you like to improve your skills, our wide-ranging program guarantees the right training for you. To get an overview of the UDC 2019 schedule – click here. Broaden your horizon and learn more about the scene. If you wish to expand your horizon you will have at the “Question & Answer” meetings the chance to look behind the scene and share experiences with all other participants. The meetings are a great opportunity to get the right info how to work and practise better. The meetings will help you to understand how to use more effectively the full potential of yourself and the people you work with, to become more successful in your area or in the international industry. There is no better place to find new dance friends. Meet old and find new dance friends, have a lot of fun and make this time to the best part of your life. Share your time over days and weeks with dancers from all around the world, from different cultures and with different experiences to get inspired and more motivated. Build new partnerships for your own dance career. There is no better place to practise and learn with and from other dancers, teachers and choreographers of all ages. To see all leisure activities during your stay – click here. Get all necessary information for your journey. Do you need more information for your journey? We will help you to get all necessary details about your travels, the airports and the best connections to plan your journey easily quick and safe. Click here for more details. The perfect place to travel from everywhere. The Urban Dance Camp is located in South West Germany in the city Lörrach at the border to Switzerland and France. Click here for more details where the event is always taking place once a year. OnlineShop: Get your own Collection! Fashion for dancers – designed for dancers – worn by dancers. Find the information how to get your own Urban Dance Camp T-Shirt collection online. You may also find new editions and colour combinations. Click here to order now from the online shop. Specifically created for international oriented dancers from around the world. With participants from over 40 nations the Urban Dance Camp gather dancers like you in an enviroment full of energy, to learn better and educate yourself more effective for your future. An international education does much more than open eyes and broaden perspectives. In an increasingly interdependent world, it is essential to fostering the global and cross-cultural knowledge and understanding necessary facts for a confident dance leadership and high competitiveness. Get the idea of a bigger picture, learn new concepts, ways of dance and how to present your art. The Urban Dance Camp is specifically created for internationally oriented dancers, teachers, and choreographers from around the world.